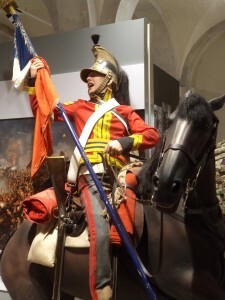 Yesterday I visited the Household Cavalry Museum and the Guards Museum. I was a great fan of the old Household Cavalry Museum at Combermere Barracks, Windsor; a large hall packed with HC items of all sorts, from campaigns in 17th, 18th, 19th and 20th Centuries (see Brit bats on Dettingen at http://www.britishbattles.com/battle_of_dettingen.htm). Just the sort of museum I revel in; multiple visits required to take even a fraction of it in. On one visit, the curator John Lloyd, Life Guards, took me round the back and showed me a stack of old Victorian photograph albums of the regiments; 1st Life Guards, 2nd Life Guards and the Royal Horse Guards. 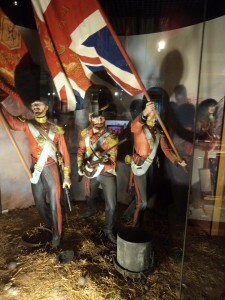 The Combermere Museum was a ‘great regimental museum’. The new museum at Horse Guards, Whitehall, London, is, frankly, a disappointment. It is small and contains a tiny fraction of the material available, and what is on display is largely for tourists, not those genuinely interested in the regiments. 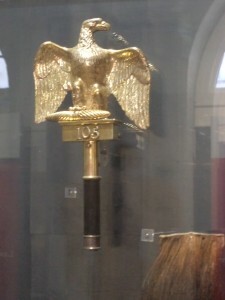 An exception is the Eagle taken from the French 105th Infantry Regiment at Waterloo by the Royal Dragoons. The saving features of the new museum are its location in the stables, with a view into the working stables of the Queen’s Life Guard, and its superb layout. Then on to the ‘Guards Museum’ by the Guards Chapel at Wellington Barracks, Birdcage Walk, London. 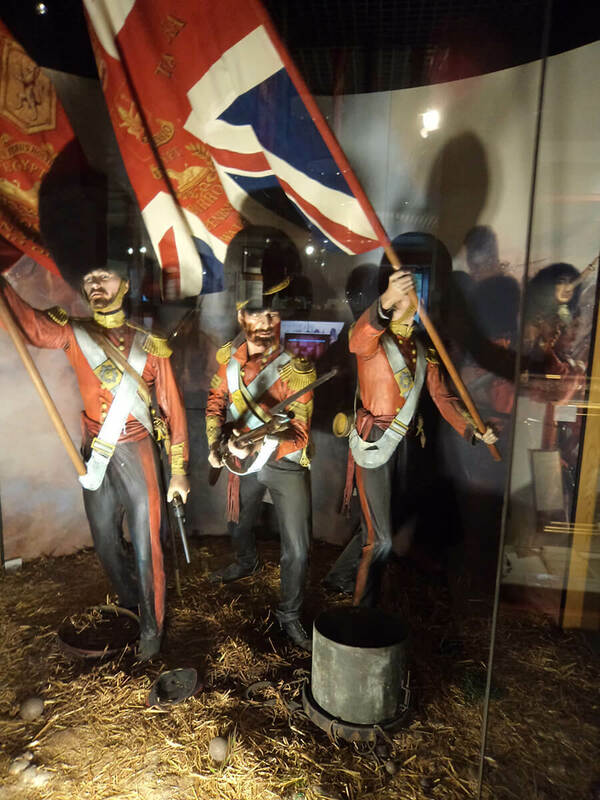 This is a proper ‘Regimental Museum’, devoted to the five Foot Guards Regiments; Grenadier, Coldstream, Scots, Welsh and Irish. It is well laid out and packed with the pieces and pictures one wants to see. All the Guards’ campaigns are well represented in the Museum. To pluck out a small sample: the Camel Corps at Abu Klea in 1885 (see Brit bats at http://www.britishbattles.com/egypt-1882/abu-klea.htm) and, of course, the Light Companies of the 2nd and 3rd Guards at Hougoumont during Waterloo in 1815 (see Brit bats at http://www.britishbattles.com/waterloo/waterloo-june-1815.htm). Ended an excellent visit gossiping with Tony Grey on the desk. Tony is ex-Royal Scots Greys, ex-Carabineers and ex-Metropolitan Police SO19 and now involved in the HAC’s Mounted Troop. Any museum having staff like Tony is a must. Out of my 5 Star rating system I give the Household Cavalry Museum 3 Stars and the Guards Museum 5 Stars.